Homemade Cranberries cacao nibs Granola. Easy to make and perfect for breakfast with yogurt and fruit. Healthy way to start any day. Preheat the oven to 300°F. Lightly grease a baking sheet with cooking spray. In a small saucepan, combine maple syrup, coconut oil and orange juice over medium heat, stirring occasionally with a spoon until the mixture is well combined. In a large bowl, combine oats, pecans, seeds, cinnamon and salt. Pour in the syrup mixture and mix until evenly coated. Spread this mixture onto the prepared baking sheet. 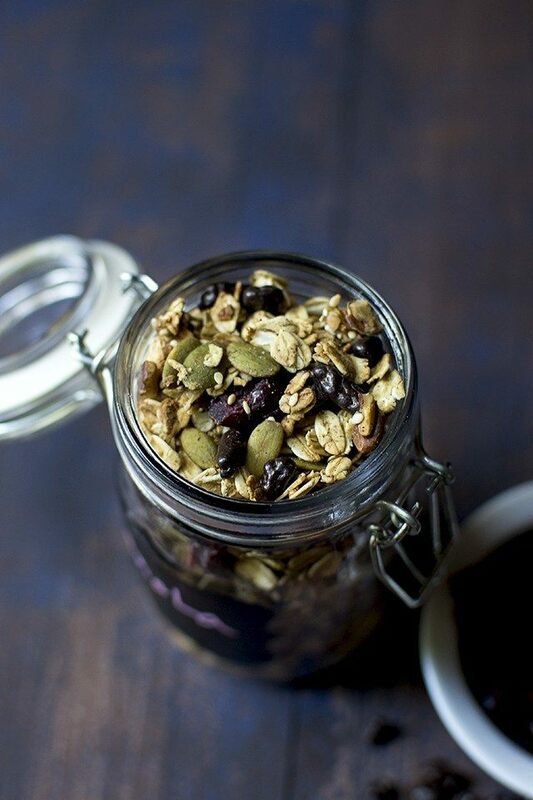 Pinch some of the oats to form small granola clusters. Bake in the oven for 45 minutes, or until golden brown, rotating the baking pan once in the middle. Remove from the oven and let cool on the baking sheet. Once it is completely cool, stir in the dried cranberry and cacao nibs. Store in an airtight container.